The LDM35 Series of products is designed to allow video display terminals (VDTs) and other RS-232 devices to be connected over distances sufficient to cover any industrial or institutional complex of buildings. These modems feature a rugged enclosure small enough to mount on the back panel of VDT units, saving valuable desk and floor space. 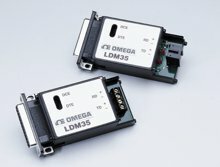 The LDM35 Series does not require a power supply for operation. The use of low power circuits and a sensitive optical receiver allows the devices to derive all necessary power from the RS-232 data and control signal. They are designed for full-duplex, asynchronous operation over two, DC-continuity, non-loaded, twisted-wire pairs. Two-wire simplex operation may be accomplished over two wires. The modem circuits and, consequently, the host device are protected from electrical transients due to lightning strikes or operation of heavy industrial equipment. Each device features a convenient Data-Communication Equipment (DCE) to Data-Terminal Equipment (DTE) switch which reverses pins 2 and 3 of the RS-232 connector. For installation and troubleshooting, each unit has diagnostic Light-Emitting Diodes (LEDs) on the transmit and receive lines. The RS-232 connector may be ordered as a male or female 25-pin connector. Field connection is made through a modern, solderless, screw-termination assembly. Alternatively, a convenient four-wire modular phone jack is available. Model LDM35 is powered by the RS-232 data and control signals from its host computer or terminal device. It receives power from Data Terminal Ready, pin 20 or Request To Send, pin 4, and Transmitted Data, pin 2. Transmitted data may be on pin 3 when the DCE/CTE switch is in the DTE position. For proper operation, minimum required signal voltage level is ±6 V at 3.0 mA to 10.0 mA.